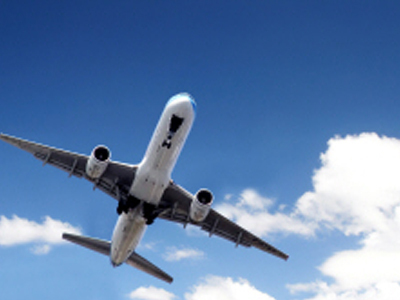 I will provide your journey by van, train, lorry, ferry or even by plane! After I connect the van with the trailor I check out visually the thread pressure in all of the tires. but contrary is the case! 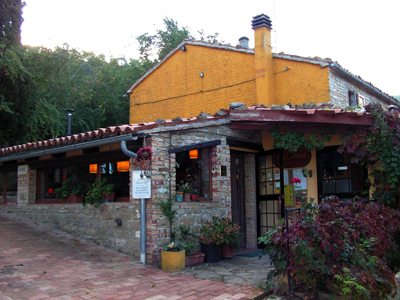 The particullar meal fed I allways discuss with the owners because the animals really need what they are used to eat. 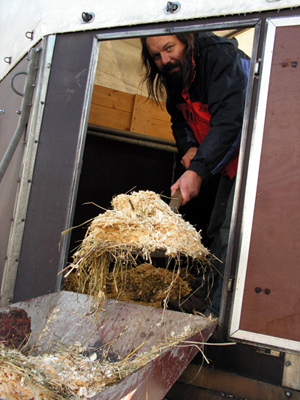 For the longer journeys I allways use shaving or straw bedding inside of the vehicle (according to onces needs). Not every horse tolerates shaving and vice versa. For the other animals travelling I usually go for a layer of shaving with a little straw over it. 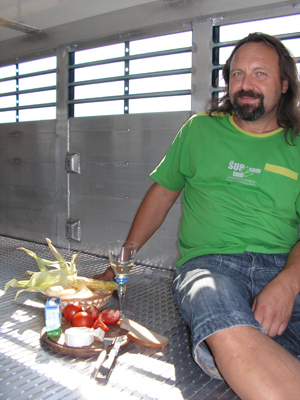 Before I start a long journey I also check out all the liquid capacities of the vehicle. I do allways arrive about 15minutes before we are supposed to leave (or sometimes even longer). 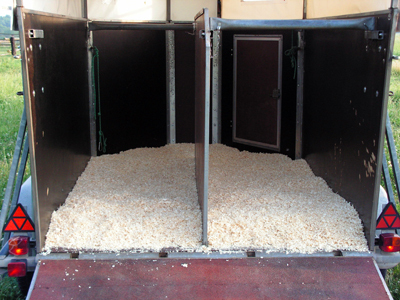 If you know your horse needs a special time to be loaded or if he is used to have special arrangements (travelling without the bars) or to take sedatives don´t forget to inform me before. 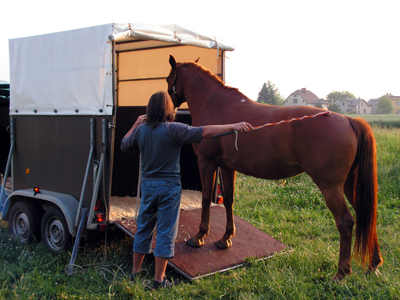 The horse is usually prepared to be transported by the owner, B rider or by a groom. I can also do it for a customer if we have a deal. 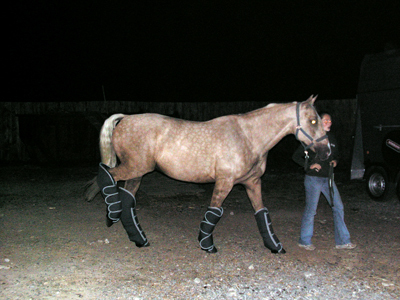 Please don´t give yourhorse the boots, a rug or a tail protector to your horse at any rate if he is not used to it! It only extends the stress the he has to undergo! 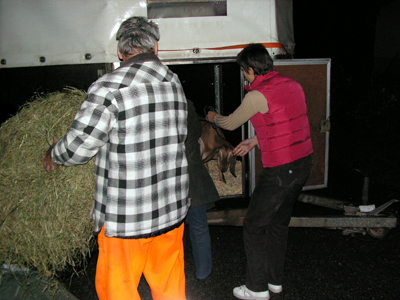 The owner usually helps the horse to get loaded on the trailor himself. of course I can help you if you ask me. 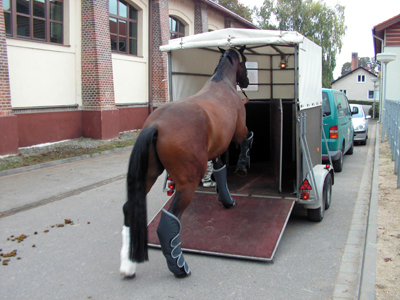 Please keep calm if there is any problem and the horse doesn´t want to enter the vehicle at the first time. Be aware itis an animal an it has also got his own head and point of view. The more you stress the horse out the more difficult the loading will be! We allways stop after four hours to swap the drivers. 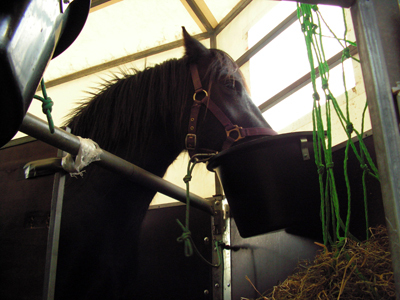 After each 8 hours there is a vet prescribed stop to give a rest to the horses. This differs with every specific animal kind. 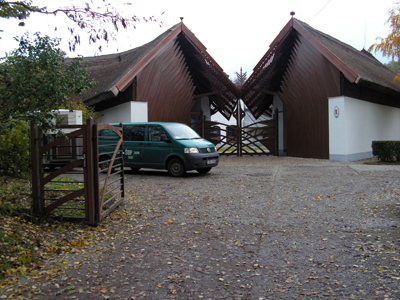 At any stop there is water offered to the horses and animals. There is also the feeding three times a day (according to a deal). 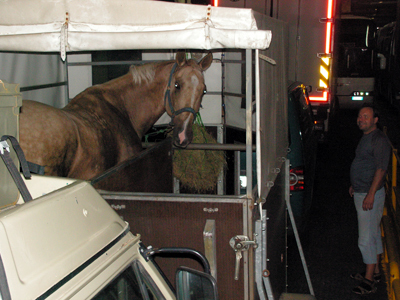 If I don´t reach the final destination within 16 hours there is a temporary overnight stabling for a horse or the other animals necessary. 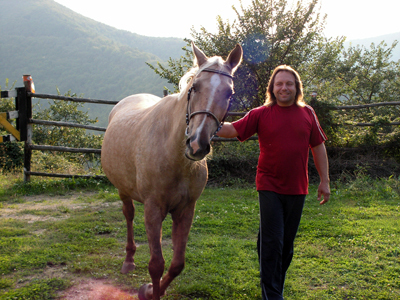 After I put a horse out I keep him walking to have a little excercise after the journey and I usually cool down his legs with water. Than I brush him and put into the box. 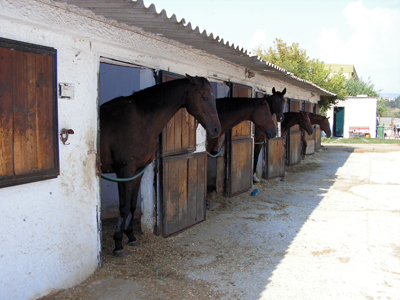 My accomodation is usually as close to the stable as possible. 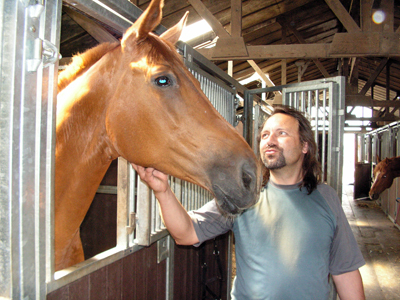 It is no exception I come during the night to check out again the horses condition. 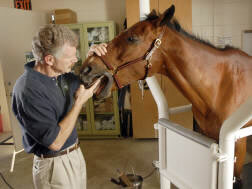 I also provide veterinary check-ups to ensure the horse is ready to travell on. 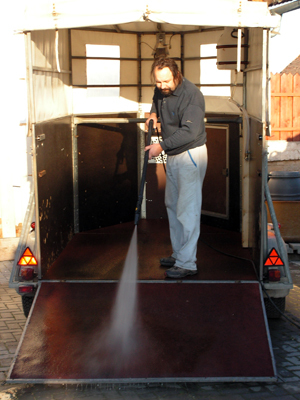 Meanwhile my colleague cleans and washes the trailor so the animal has a full comfort and care in it the next day! The acces to the port is unless exceptions well sighned, but there is a lot of obligatory check-outs in the international zone. I allways ensure myself to be in the departing are one hour before I should leave. 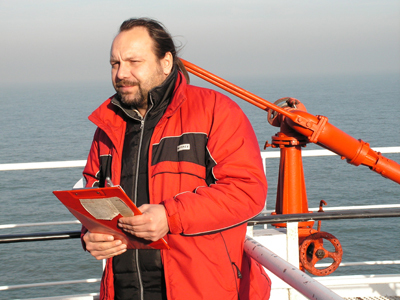 In regard of the ferry is ordered in advance there is usually no delays with the loading on formalities. 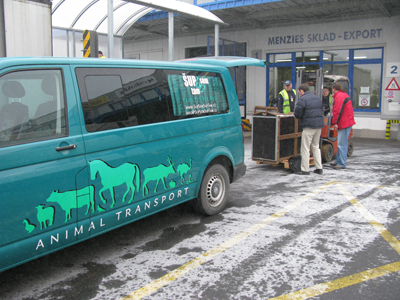 It is really good to inform particular members of staff that I transport an animal. Than I usually have a prior check out and they try to find the best place for for entering the ferry and for the parking. and a milimeter exactly to the final position. It is really not worth doing it on your own! They are simply proffesional. and make a deal to have the possibility to came and check out the animals regularely when crossing. The loading area is actually closed up to the passangers. You can only enter there accompanied by the security staff. Because the staff is changing every four hours I have a sign behind the screen of the vehicle with my name, number and setting. For any case - we are human, aren´t we? This kind of transport is a topic itself! 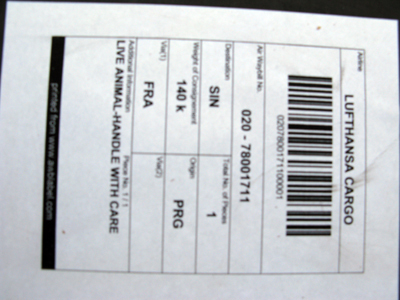 The basic is to have the maximum of exact information about animal number, kind and leaving and final destinations. 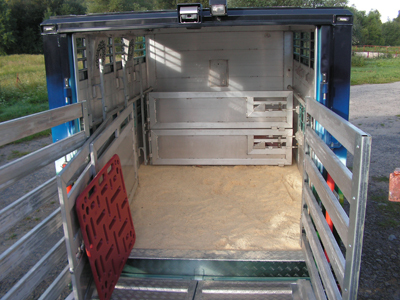 That leads you to the particular steps and arrangements for the journey (safety, veterinary, quarantine etc.) and price. It is much more about the legislative and it also takes more time to find the optimal offer. 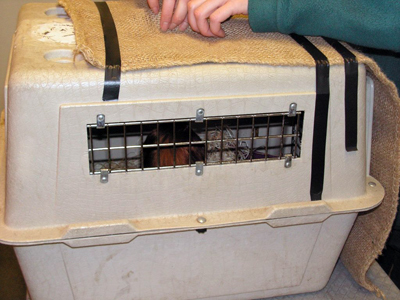 When I arrive I turn over the animal and the travel documents to the hands of particular person. I will ask him to check out its condition and I will give him information about the transport. 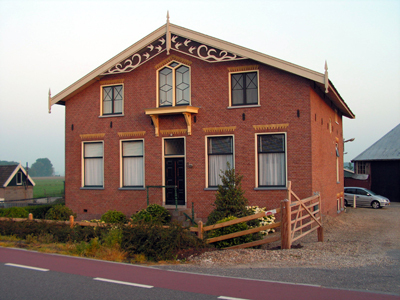 If everything is ok (according to the print contract we have) the job is finnished. 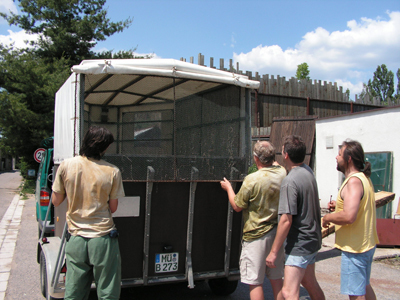 Than I´m going to clean the truck or the trailor for the next animals so they have it clean and ready. I allways do the desinfection too when I come back home. Actually I think that the clean trailor makes the name of the transporter. What else? 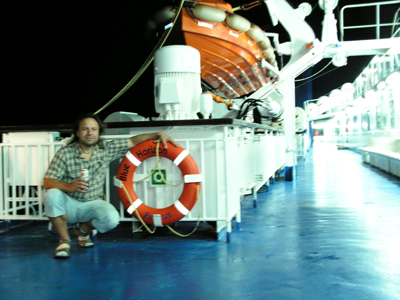 Now I´m just going to have some coffee, maybe I´ll sleep over and let´s go home! I´m just presenting you the way I work! I belive that the question is how much information are you going to share before you set to the journey. If we share the most information before the departure than it is enaugh to wish a SAFE JOURNEY! You may wonder but I really DO drive according to the paragraph!